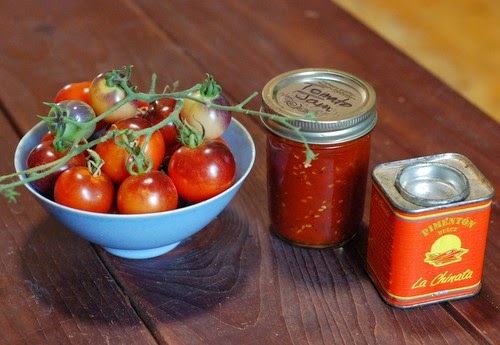 I first discovered tomato jam at the Corrales Farmers’ Market, a simple concoction of tomatoes, sugar, and lemon juice. I thought it was strange at first, a savory jam… but as I found more and more delicious ways to use it, I couldn’t get enough. It’s wonderful on an everything bagel with cream cheese, an English muffin with a poached egg, or alongside roasted chicken. It took me a while to find a recipe that was similar (and along the way I found this recipe, which is also delicious) but just recently I found perhaps my favorite version yet, in Saving the Season by Kevin West. I used some gorgeous little Indigo Rose tomatoes that my favorite neighbor grew. This open-pollinated variety is extra-high in lycopene, and the purple tinge comes from anthocyanins, another great antioxidant. I love black pepper and smoked paprika, so I used way more than in the original recipe, for lots of intense flavor. I also modified the recipe to use honey instead of sugar, and it was a triumph! Chop the tomatoes coarsely. Combine all ingredients in a large saucepan and bring to a boil, uncovered. The pan should be no more than half full, because jam tends to bubble up so much that it might overflow a smaller pot. Cook about 30-40 minutes, stirring often, until reduced and thickened. The jam takes on a translucent quality when it is getting close to done. To test, you can put a drop on a chilled plate - if it holds together, it's done; if it leaks liquid at the edges, it needs a little more time. Meanwhile, heat two half-pint canning jars in a pot of boiling water for a few minutes, then drain and set upright (the heat from the jars will dry them quickly.) Keep the water at a low boil. When the jam is ready, pour into jars and wipe the lip with a wet paper towel. Dip two-piece lids into the boiling water to warm them, and screw on fingertip-tight. Process the jars in the boiling water bath for 10 minutes at sea level, 20 minutes at 5000 feet, or 25 minutes at 7000 feet.